Everyone is talking about the importance of mobile and making sure that content works well on small screens, but it’s also clear that publishers still make the majority of their revenue from print. So do publishers really need to bother about mobile? And is there an opportunity for apps beyond having a responsive website? YES. 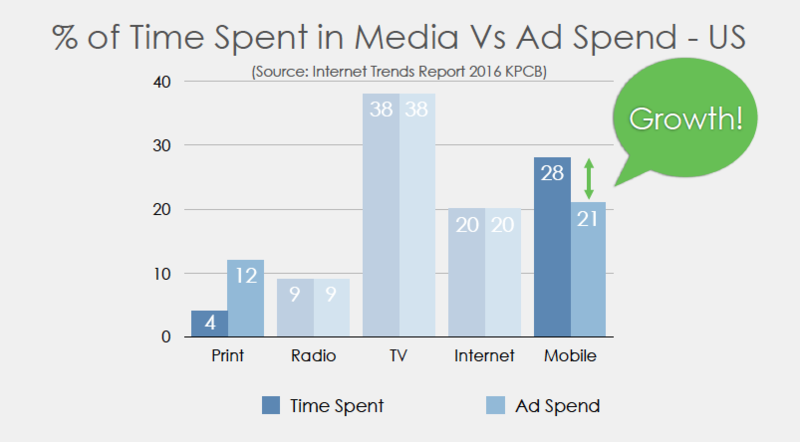 Print might still be generating revenue right now but it's under threat as the seismic shift in content consumption via mobile continues (2017 Internet Trends Report). Print remains and should continue to be a massively important part of the publishing mix, but mobile is a huge growth opportunity. Publishers need to start experimenting early to find a winning formula, and then capitalise when paths to revenue start to open up. Are you looking for ways to monetise your content digitally? Download our FREE publishers guide to building an effective mobile app strategy! Starting with print, publishers need to maximise their return, especially given that we’re talking about it STILL being the primary source of revenue. Even in decline publishers should maintain or even improve it’s quality. They should consolidate print runs to ensure it’s optimised with minimum wastage, that way publishers can manage their print costs down without compromising on quality. Good data management and cleansing can also help to achieve this. Click here for a free health check of your data. Publishers should use print ready files for their first foray into digital publishing, but ensure their chosen platform also supports a digital first workflow should they need it. Flexibility is key so it can grow with the business. It’s common for some publishers to think that because they have a responsive website they don’t need an app. A responsive website is of course a very important part of the content mix but research shows us that users prefer apps and the native device experience they offer. Publishers should take note of this and aim to find an affordable solution that delivers a strong user experience and dovetails with their existing workflow. Apps can even help drive traffic to websites as web content can be fed directly into the app providing a continuous content experience. This results in a more engaging app, as users don’t need to wait a week or month etc. for a new edition to be published. 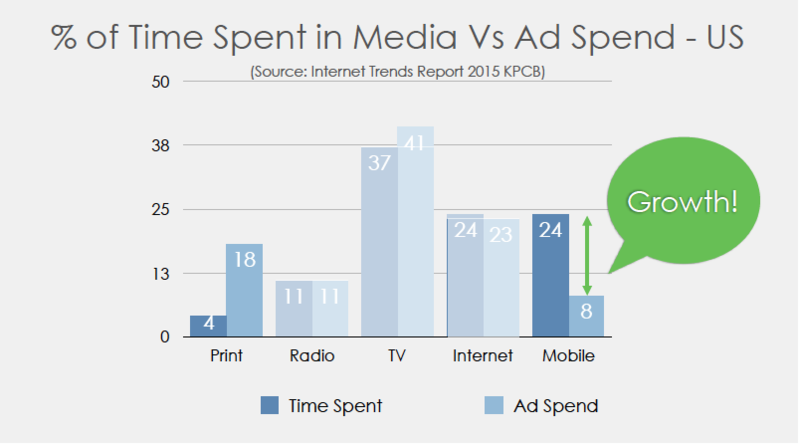 Annual research from Kleiner Perkins tells us that the majority of ad spend remains in print whilst the majority of time spent consuming content has shifted to mobile (see images below). If you compare this to the report from 2015, time spent in mobile is up 4% year on year whilst ad spend in mobile is up 13% year on year to 21%! This is a clear indication that mobile ad spend has started to accelerate, a huge opportunity for publishers. The popularity of social apps is largely because users know there will be brand new content delivered continuously. This ensures they are always entertained and they form a habit of opening it regularly. Publishers can mimic this by delivering content on the regular basis in between publishing weekly or monthly editions. Publishers can also react to ‘moments’ and deliver special editions in a very short space of time without the limitations or costs of doing the same in print. These could be; royal weddings/baby’s, celebrities, sporting triumphs, music etc. If you are a publisher with lot’s of archive content this process can be made easier. Similarly, publishers with archive content can use that to effortlessly create apps and editions that have value. Take recipes for example, publish a diet app or christmas food app from existing content and without creating anything new. In a sea of content, publishers need to ensure theirs is discoverable. This can be achieved by using social feeds and various distributed content channels like Facebook IA and Google AMP. Once discovered, publishers need to be able to guide readers back to their owned channels (like magazines and websites) in order to monetise. Apps are another owned channel destination that publishers can use to grow and monetise their audience. Publishers should concentrate on what they’ve always done best, creating amazing content that it’s audience loves to read. They should avoid any temptation of reducing print quality in order to fund digital expansion. Instead it’s important to ensure their choice of digital publishing platform is affordable and doesn’t have any hidden costs. Publisher’s shouldn’t need to hire any additional staff and everything should dovetail nicely with existing workflows. The first step to monetising mobile should be delivering a strong reader experience. Publishers should keep that principle central to everything they do in order to capitalise on the mobile publishing opportunity. Are you a publisher who is looking to optimise their content for mobile? Download this guide.